Okay let’s play a little game. 2 eggs can you guess which one is truly farm fresh free range egg? 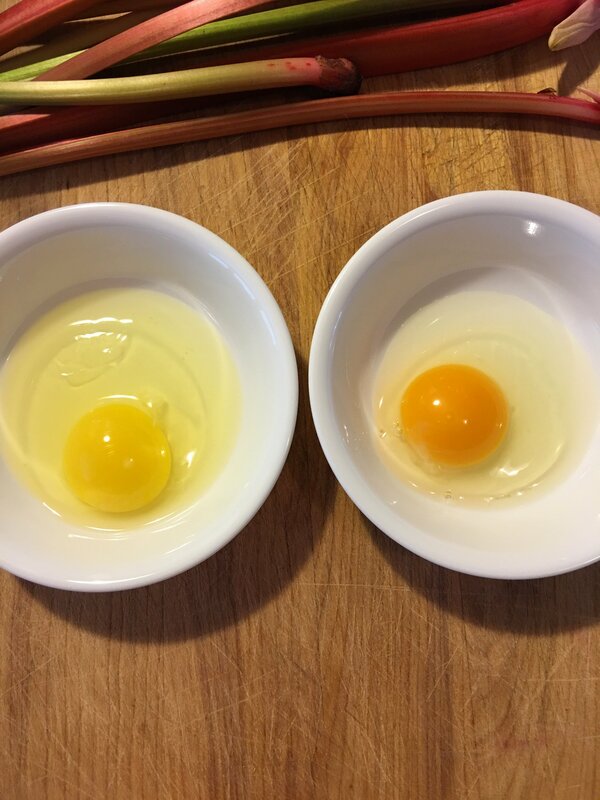 The one on the left is large and a healthy looking brown, the one on the right is smaller and a white egg. 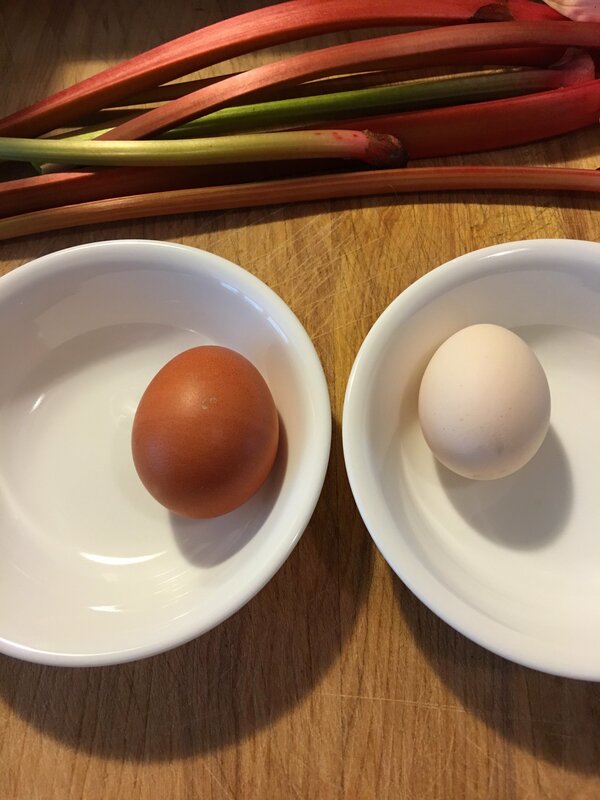 Which egg is a farm fresh egg? If you haven’t guessed it, the white egg. It’s an egg from a ornery silver speckled Hamburg named Ostrich. 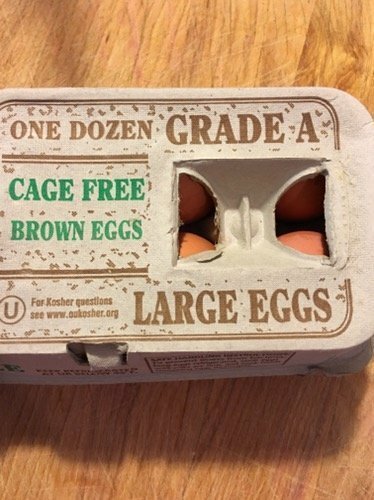 The other is a brown egg from a store carton, labeled cage free. So what did you guess? Did you think the brown one was farm fresh? It looks healthier right? Whole wheat bread looks healthier and browner than white bread. That’s where marketing has got us! It looks healthier! But that’s where it ends my friends with the looks. That Cage Free label has us picturing hens out free ranging, scratching at fresh dirt. Foraging for bugs they like along with plant material, right? The chicken that layed that beautiful brown egg is likely inside a warehouse size building, never to scratch in fresh dirt. Far from natural chicken foraging behavior, or the natural light of day as far as that goes. Not a happy little hen, not a healthy egg! Luckily raising hens for eggs is so easy, and even most cities will allow backyard chickens now days! It is my goal to show people everywhere that raising chickens for your own eggs is easy, affordable and fun. Chickens are such a part of our family and the kiddies love having them! We started Chickens as city people, Urban homesteaders, as people who knew nothing about chickens. You don’t have to be an expert or have a background raising poultry to become a little bit more food responsible and provide your families needs for eggs! Want to know where to start? There are a ton of resources out there, and hatcheries to order from online! Follow us on instagram to see our chickens around the farm. And check back for a post on starting chickens for eggs!